As the owner of a building, you should know the top 10 ways to prevent fire in the workplace. This will help you create a safer work environment for everyone in the building. Not to mention, the right fire prevention practices can ensure your building doesn’t go up in flames as easily. In this blog, we will highlight the top 10 ways to prevent fire in the workplace. These tips can not only save lives, but they can also help raise awareness about fire safety and fire protection in your building. The best thing you can do is educate the building occupants and abide by safety regulations to keep your building up and running smoothly. Make sure all of your fire protection equipment (ie fire extinguishers, control panels, etc.) are easily accessible. Also don’t block the fire sprinklers or fire alarms with anything, such as dust, debris or paint. You don’t want to hinder the functionality of your equipment. Discard of any hazardous waste in a metal container that has a lid. Hazardous waste can include anything from oils to chemicals. Even flammable and combustible materials should be properly disposed of in order to prevent fire hazards. Schedule regular maintenance services for all of your fire protection equipment to make sure everything is up to code. It’s also smart to make sure any machines in your building are properly maintained in order to prevent overheating or sparks created from friction. If you have chemicals, flammable materials or other hazardous substances in your building, you will want to make sure they are stored in a safe place. Make sure they are in a dry, secure closet or room that has adequate ventilation. It’s also a good idea to keep fire protection equipment for flammable substances near the storage area just in case. There are many reasons that you should keep your building neat and tidy. One of the main reasons is because when there’s a lot of clutter, especially flammable materials such as paper, boxes, etc., then a fire can spread faster. The clutter could also block exits and make it harder to escape if there is a fire. So make sure to keep the inside of your building clean and clutter free. 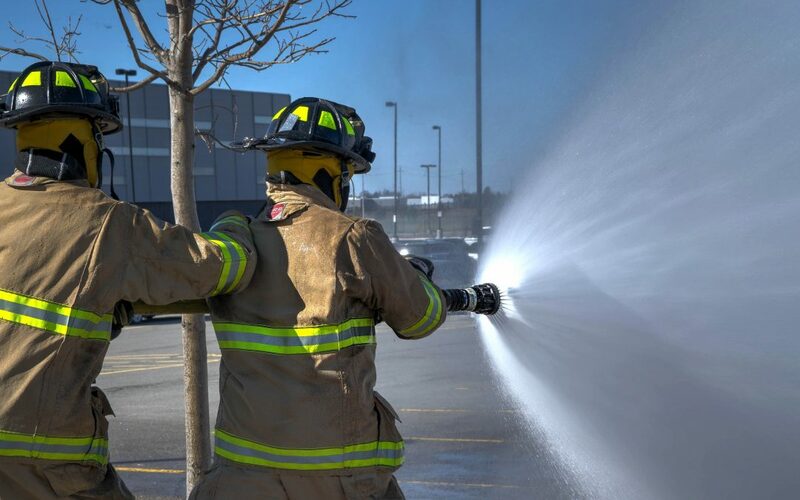 Fire safety demonstrations can go a long way when it comes to the safety of your building. Make sure to teach building occupants how to react to a fire and how to use a fire extinguisher, along with the other fire protection devices. This can help to prevent a fire from spreading if one does occur in your building. Arson is one of the leading causes of building and structure fires. That’s why it’s so important to invest in building security. Building occupants should know to lock up the building behind them and they should know how to report suspicious behavior or people if they see something a little off. There should be a designated smoking area that’s a safe distance away from the building. Also make sure to provide ashtrays or other safe options for people to properly extinguish and dispose of their cigarettes. This will help keep your building safe from accidental fires caused by lit cigarettes. Emergency and evacuation plans are important to prevent further damages or issues if there’s a fire. It’s important that if someone needs to call for help, they know what to do, how to easily find the building address, and what the next steps should be. Fire prevention is just as important after a fire has already started because it can reduce the risk of it spreading, which can lead to more damages. Today there are safety standards and regulations put in place to help businesses better prevent fires in the workplace. Both OSHA and NFPA provide a set of rules and guidelines to ensure fire protection and safety. You’ll want to make sure that you meet all of their requirements to remain up to code and secure. Now that you know the top ways to prevent fire in the workplace, you can invest in high quality equipment. Frontier Fire distributes and installs the best fire protection equipment in the Rocky Mountain region. Whether you’re in need of fire sprinklers, fire alarms, or fire protection services, we’ve got you covered.